World Space Week (WSW) is an annual event celebrating the global Space sector in all its forms. Taking place this year from 4th to 10th October 2018, this WSW is focusing on international cooperation in space, based on the theme ‘Space Unites the World’. We take a look at the UK Space Agency’s recent report on disaster relief and resilience, and the role the UK space industry plays in it. 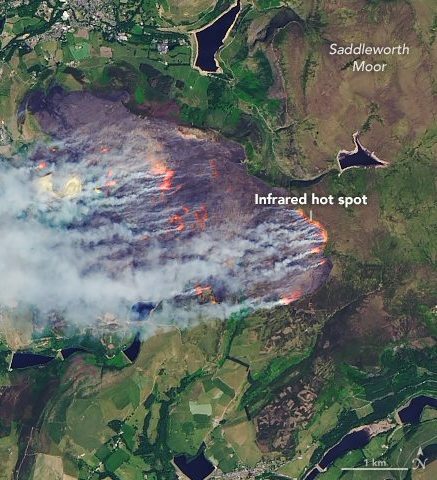 The Saddleworth Moor wildfire near Manchester raged for over three weeks in June to July 2018, covering an area of 7 sq. miles of moorland at its peak. Local firefighters, police and soldiers played a visible and crucial role in bringing the fire under control, but far above the moors a range of satellites invisibly helped to monitor the spread of the fires and coordinate the response. The EU’s Copernicus Emergency Management Service provided detailed maps of the fire, and imagery was also provided by the Airbus UK-operated, UK-built Disaster Monitoring Constellation. While the UK’s future participation after Brexit in Copernicus is still undecided, the UK has played a vital role in this programme, mostly recently with the delivery of the UK-built Sentinel-5 Precursor satellite. Looking abroad, the UK Space sector is supporting disaster relief and resilience efforts in many countries. For instance, the UK-based Avanti Communications Group are leading a project in Kenya to use satellite systems to build secure and resilient emergency communications and situation assessment for natural disasters such as droughts, floods and disease outbreaks. Elsewhere, the British satellite communications firm Inmarsat is working with the Philippines government to improve their emergency communications system for disaster response. Both of these projects are part of the International Partnership Programme, which is a 5 year, £152 million programme run by the UK Space Agency. These are just a few examples of how the expertise of the UK Space sector is being harnessed across the globe to tackle a wide range of environmental, health and agricultural challenges. The UK space sector has seen a huge 71% growth between 2012 and 2017 – it’s an industry that is thriving. This will cement the UK’s leading role in small satellite construction and Earth observation technologies, all of which can, and are, being used to support disaster areas across the globe.